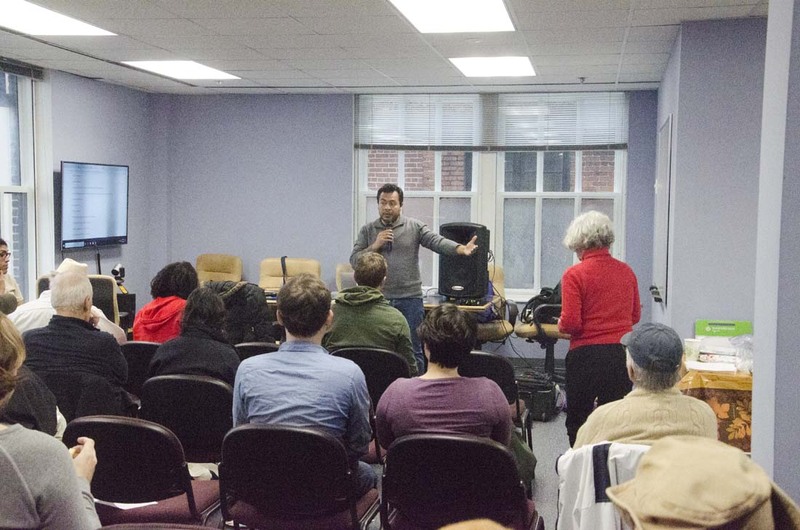 Amilcar Valencia, director of El Refugio, speaks to November general meeting. “Solidarity in Action” was the theme of MADSA’s last two general meetings. We started in October with presentations on organizing and our resources for members. Gregory McKelvey, our newest officer (at-large), shared lessons from his impressive organizing experience in Portland, OR, and we touched on the many resources MADSA offers members to help their activism. A “socialist speed dating” exercise helped us get to know each other better by sharing in rotating pairs what led us to join MADSA. November‘s meeting (and fabulous potluck dinner) at our office featured Amilcar Valencia, director of El Refugio, which helps immigrants in the notorious Ft. Stewart detention center by facilitating visits from families and others. Our Immigrant Justice working group is organizing a visit to Ft. Stewart Dec. 29 to hear detainees’ stories in person and express solidarity, and holding a postcard and letter writing campaign to our Congress members urging that ICE be defunded. To participate: alexanderhernandez@madsa.ga. We continued the action theme by agreeing to sponsor “People’s Inauguration” events at the Ga. Capitol, in collaboration with partner organizations, the day before and during Brian Kemp’s takeover of state government Jan. 14 – more info as plans develop. We accepted Anaia Leilani Jolie’s application to take Matthew’s place as a grievance officer. “I have clinical experience with conflict resolution and feel that with our current state of world and political affairs, there is no room for division,” she says. We need one more grievance officer. They will work to ensure fair treatment and safety for all MADSA members. If interested, contact executive@madsa.ga. A “temperature reading” of those present agreed to host DSA’s national convention in Atlanta this summer, at the Westin Peachtree Plaza hotel downtown, an exciting opportunity to meet comrades from all over the country and help shape DSA’s future. We will be required to provide logistics guidance for our visitors, some free housing, and a social event which can be a MADSA fundraiser. More details will follow. For a report and photos of the 2017 convention, held after DSA grew from about 7000 to 25,000 members nationally, see our Summer 2017 Equality newsletter; we have since grown to more than 52,000 members!